As summer approaches, you’ll want to be heading out on the trails as much as possible, but sun, heat, and bugs can make trail rides unpleasant. Looking to get the most out of your rides? Here are some things that you’ll want to be sure to bring along. Nothing is worse than pesky flies on what should be a leisurely ride through the woods. Equip your horse with a fly mask (over his bridle) or at the very least, an ear bonnet. Your horse will appreciate it, and you won’t have to deal with his frequent head tossing or head shaking. Yes, that’s right – tie a sponge to a six-foot length of string. Wind the string around the sponge and fasten it to the back of your saddle. As you come to water crossings or ponds, halt your horse, unwind the string, and drop the sponge down into the water. Hold onto the end of the string, then use it to pull up the wet sponge and wash your horse down. The string lets you do this from the saddle without having to get off your horse. It can also be a great idea to plan your rides so that you regularly pass by bodies of water. This will give your horse a chance to rehydrate and you an opportunity to wet him down. While sponging your horse down will help cool him down, you’ll need to be sure that you also stay hydrated. Bring along a bottle of water or two, and take frequent breaks to drink. Remember, if you feel thirsty it means that you are already dehydrated. Stay ahead of dehydration by making yourself drink even when you don’t think you need to. Don’t forget to apply sunscreen to your own skin. If your horse has pink skin around his eyes or his nose, he may benefit from some sunscreen, too. The sun and temperature will be at their highest in the early afternoon. Plan your rides accordingly so that you are not out during the hottest points of the day. 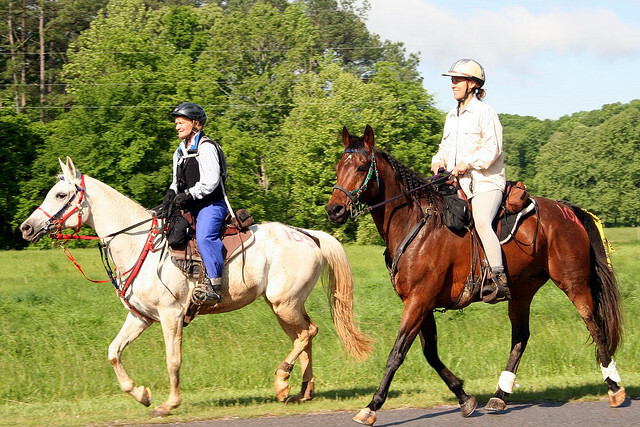 Heading out early in the morning before the heat has had time to build up, or going for a late afternoon or early evening ride can make a big difference in the temperatures that you and your horse must contend with. If the heat is oppressive and your horse is not conditioned to longer rides in the heat, keep your ride short and low-key. It’s also a good idea to opt for trails that offer periodic shade to give you and your horse a rest from the sun. Trail riding in the summer can be fun, as long as you’re well-prepared.